With the exception of baby Baxter himself, this little guy could quite possibly be my dream car. The kind of car that I have wanted for as long as I can remember. I’ve never really wanted something new or something fancy, but instead just something that made me smile. Something cute, but at the same time something beautiful and preferably, something a little bit Vintage. The kind of car that you only have to look at and you could already tell that it had its very own story. That’s the kind of car I always dreamed of. Don’t get me wrong though, Baxter is absolutely beautiful and I love him to pieces and even if I could, I wouldn’t trade him for the world. It’s just he wasn’t exactly what I had in mind when I was dreaming of my first ever adventures. For as long as I can remember, I’ve dreamed of never ending dirt roads, loud country music, my favourite boy in the seat beside me and a little old Vintage car leading the way. 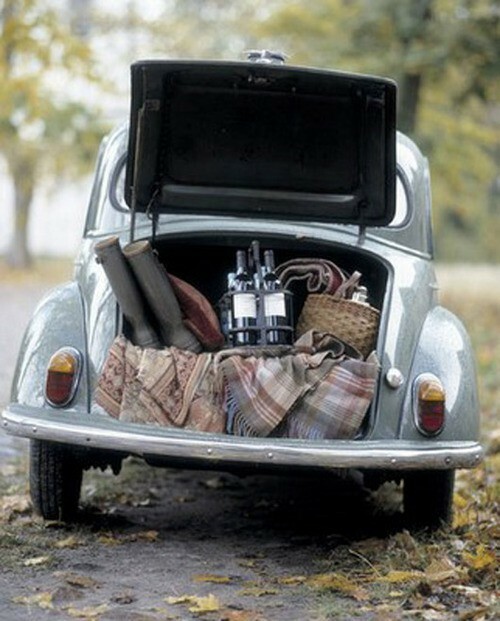 A boot filled with old suitcases, checkered blankets and a picnic basket full of my favourite treats. We’d drive until the road reached a perfect little town, where’d we’d stop and set up camp. We’d lay on our giant blanket, under the shade of a beautiful big willow tree and we’d make pictures together from the shapes in the clouds. Time would pass us by, but we wouldn’t know just how much until the sun hid behind the trees and the moon took its place. We still wouldn’t move though, instead we’d stay out under the moonlight and take turns to see who could count the most constellations. Chances are he would win that round, I’m much better at the clouds version. Soon enough, it would get cold and he’d pull me in closer to stay warm. He’d look at me with that sparkle in his eyes and we’d both smile. The kind of smile that doesn’t need words, because it already means more than anything either of us could ever say. Eventually, we’d say goodbye to that little old town, taking with us the memories of an unforgettable adventure. We’d head back along that long dirt road and our perfect little Vintage car would lead the way back home, with yet another magical story to add to it’s collection. Only this story, this would be ours. One that would stay with us forever.